To read the Prologue, click here. To list to interviews on National Public Radio, click here. When Allan Johnson asked his father where he wanted his ashes to be placed, his father replied—without hesitation—that it made no difference to him at all. In his poignant, powerful memoir, Johnson embarks on an extraordinary, 2,000-mile journey across the Upper Midwest and Northern Plains to find the place where his father’s ashes belong. 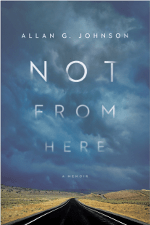 As a white man with Norwegian and English lineage, Johnson explores both America and the question of belonging to a place whose history holds the continuing legacy of the displacement, dispossession, and genocide of Native peoples. Even more, Johnson’s ruminations exhibit a stunning level of awareness that bridges the personal with the political by recognizing his part in the unjust system as it exists today for American Indians, as a beneficiary of the settler colonial state structure that is the U.S.
Not from Here is available in hardcover and Kindle editions. You can order a copy from Amazon.com, Barnes & Noble.com, or your local bookstore. One Response to "Not From Here: A Memoir"
I look forward to reading this memoir.